Demonstrators go to Explanada de los Ministries to protest against corruption and demand the ousting of President Dilma Rousseff in March 2016. 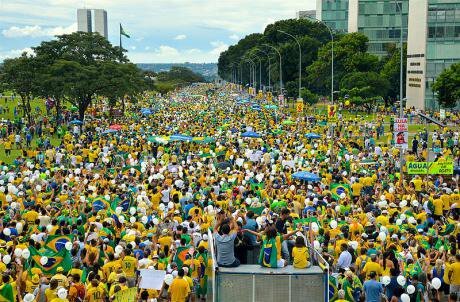 Using the Brazilian colors in protests has become an anti-PT (Workers' Party) symbol. Creative Commons. This is the story of what happened in the plebiscite for peace in Colombia, which ended up with a rejection of the Peace Agreement. It is a very similar story to that of the current political polarization in Brazil, and that of the UK European Union membership referendum, and that of the election of Donald Trump... It is, in short, the story of what happens in any political discussion occurring in the social media. Who has never participated in an irrational debate in which a huge amount of lies is shared ad infinitum? Do you remember the maxim: "a lie that is repeated a million times ends up being true?" Many people in Colombia, for example, believed that if they voted for the Peace Agreement they would actually be voting for the FARC leader to become their next president. Who has never wished to write a post reminding people of this maxim and getting to communicate with them, drawing their attention to some facts, focusing on some data… but finding that you simply cannot speak to everyone? Worse still: seeing all the sponsored posts, fake profiles and "robots" dominating the whole space in social media. Who has come to realize that we are limited by an opinion bubble we share with friends who think alike – which is the very thing that happens to social media users? That we are losing touch with what is different and stop having the ability to debate with those who are different? Who has never felt that he or she is swimming against a current of manipulation and fear that ends up dominating people’s perceptions, and that we have no voice to oppose it? The issue of polarization/manipulation is one of the main problems of digital democracy. Along with digital exclusion - both in terms of access (inadequate infrastructures and costs that are excessive for a significant proportion of the population) and in terms of the high cognitive barriers that fuel forum debates which attract many comments but make it difficult for those who have little time or are uncommitted to participate -, the issue of polarization/manipulation is one of the main problems of digital democracy. It was precisely to find a solution to that problem that we traveled to Madrid to attend the Participalab/Medialab Prado’s Collective Intelligence for Democracy workshop. Our particular challenge was to find a technology that could respond to two questions: how to empower those who are in a minority and are being crushed by an avalanche of manipulated messages, whose messages on social media have no visibility and reach a decreasing number of people? How to make it possible for the undecided to be informed and to share questions - and diversity - with the majority? This is precisely what the Pushing Together app seeks to do: to channel minority voices into the main flow of communication, allowing all parties to be heard and ensuring that different opinions are always visible. This it does by promoting collective action through PUSH notifications which act as checks and balances, adding diversity to the debates and preventing one side from dominating the main flow of communication, which is what happens in the main social media. This is an app which uses free software licenses and which can work with other free network conversation tools. To start with, we chose Pol.is, which is a web-based conversation app with a minimalist engagement interface that identifies and displays opinion groups and proposals out of participation data. We worked with it on finding a solution to the main problems which, we have found, are related to the use of network democracy tools - both to overcome the complex and exclusive architecture of the tools used by governments, and to guarantee the presence of diversity in the opinion bubbles which alienate people from informed debate and damage the ability of minorities to communicate their agendas. The Pushing Together app should be a powerful tool for political organizations and governments to conduct participatory consultations and deliberations avoiding the risk of opinion bubbles and the manipulation and polarization of virtual debates. We set up a team involving three organizations (Cidade Democrática, LAPPIS and Red Libre) which together constitute a powerful free technology production network in Brazil. In addition, we relied on direct collaboration from Colin Megill, the co-founder and CEO of Pol.is, and Audrey Tang, Taiwan’s current Digital Minister, a hacker and activist who has carried out Pol.is main political tests. The Pol.is team has considered our app innovative and has shown interest in integrating it into its core. This comes to confirm that we have created something relevant, the impact and sustainability of which only increases with its incorporation to Pol.is. Our demands and provocations accelerated a license change - formerly BSD, now aGPLv3 - during the lab. This change renews trust in the use of the tool, since free access to the code is guaranteed. Whoever wants to see the Pol.is API at work will be looking at our code. Our study and research, together with the materials documentation it has produced, contributes to the effectiveness of Pol.is as a common good, for it makes it easier for people to develop apps using it. The knowhow and the stories we have encountered at the ParticipaLab have allowed us to discard our previous insight. Having managed to build a common good steadily anchored on the Media Lab leads us, furthermore, to being optimistic about the connections that can arise in the near future, considering the centrality of this laboratory in today’s e-democracy ecosystem. Having completed the prototype, we are now ready to carry out the first experiences in Brazilian cities. The Pushing Together app should be a powerful tool for political organizations and governments to conduct participatory consultations and deliberations avoiding the risk of opinion bubbles and the manipulation and polarization of virtual debates. Its distinguishing element is its user-friendliness – including its use by uncommitted citizens - and the low development and maintenance costs, which enable local governments in small and medium-sized cities to use it. Today, there is a demand for implementation, training and development services for local governments in Brazil. 62% of the country’s city councils currently have a social media (Facebook, Twitter, etc.) profile or account, but only 4% have created and made available to the public their own digital apps. Only an open-source arrangement developed using open source software can enable the state's adherence to and maintenance of state-of-the-art technologies. One of the reasons why is the lack of financial and technical resources for contracting and producing technologies, which means that, in addition to the new technologies, new business models need to be created to ensure greater sustainability and viability in the context of the legal and financial barriers local governments are facing in Brazil. The development a consortium, inspired by similar initiatives in other parts of the world, appears to be a possible solution. That is, contributing small sums reduces the costs for each client, while allowing to meet the investment requirements. The operation of this consortium must be based on seed capital attracted by the Cidade Democrática Institute to fund the technological development and the creation of the cloud where the Pushing Together app is to be made available and, at the same time, to carry out pilot projects in three cities. The sale of low cost services - installation, training, mobilization and maintenance – to local governments should guarantee its implementation in twenty Brazilian cities over a period of two years. At the end of these two years, the total amount from the sale of services to local governments should be equal to the value of the start-up capital. Both from the point of view of costs and autonomy, only an open-source arrangement developed using open source software can enable the state's adherence to and maintenance of state-of-the-art technologies.